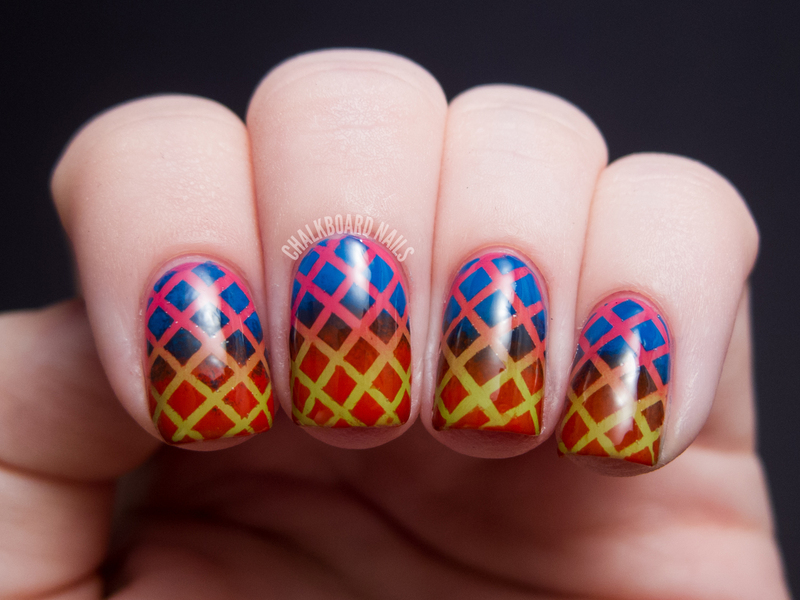 If you've been checking out the nail blogosphere lately, you may have started to see some swatches popping up of the China Glaze Cirque du Soleil Worlds Away Collection. It's really a fun set of polishes and I think it will appeal to many. Today, I'm going to show some nail art I created using four of the pretties in the collection! Ta-da! Looks pretty neat, huh? Now ask me how long it took. "How long did it take?" Forever! I am not very fast when it comes to placing and cutting striping tape, apparently, but I'll get into the process a bit later into the post. Despite the effort, I think these nails were worth it! I wore them for a few days and they were just as exciting to look down at... even on the last day I wore them. That lovely green apple color you see is Def Defying. I love this color and the formula is great, requiring only two thin coats for opacity. The pink color near my cuticles is Escaping Reality. Again, you only need two coats for this one, & I really like this shade of pink! The bright blue is Hanging In the Balance. It's gorgeous and opaque at two coats. I also tried wearing this one alone and was able to avoid staining by using two coats of base coat. Finally, the red shade. It's called Igniting Love. It's normally a very bright and vibrant red. Unfortunately, this swatch of it is not very accurate because the color was altered a bit when I sponged it on over the green. Still quite pretty, but not as informative for you readers! For this look, you'll need a few nail art tools in addition to the four colors: a triangle makeup sponge, striping tape (check eBay or Amazon), and loads of patience. I first sponged a gradient onto my nails using the triangle makeup sponge. I grabbed Def Defying and Escaping Reality for my first combination. Then, I let my nails dry COMPLETELY. You can use a quick dry topcoat at this step to speed up the process. I grabbed my striping tape and placed pieces of it in a criss-crossed mesh pattern on my nail. Once I had placed them all, I went around and pressed down all the edges to ensure a good seal between the tape and my nail. Using a clean side of my triangle makeup wedge, I sponged on a gradient of Hanging In the Balance and Igniting Love (over the tape). I did two rounds of sponging before slowly removing the pieces of striping tape. All that was left to do was to topcoat! The China Glaze Cirque du Soleil Worlds Away Collection has a number of other great shades that I hope to be sharing with you soon. These will officially be released the first week of December at salons and beauty retailers like Ulta and Sally Beauty, and each shade retails for $7 each. It's so lovely, and a gorgeous color combination too! 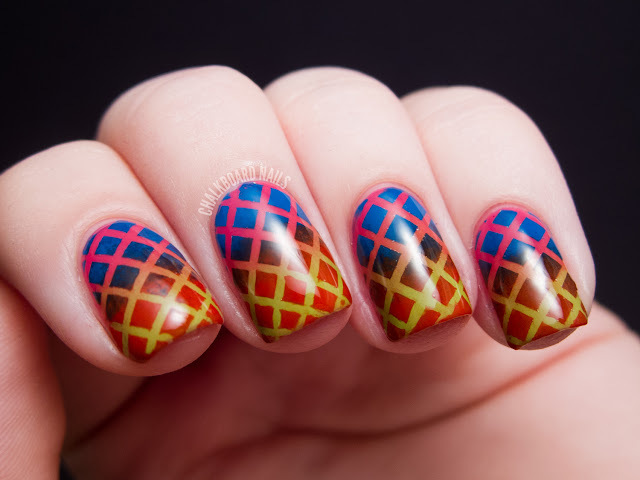 Already a beautiful gradient mani, your gradient stamping lends a real circus feel. This is amazing!! I love the look and your hard work totally shows! Crazy beautiful! I love this look and I don't feel sad not seeing the "true" colors of the collection here as I've seen them on other blogs. You are amazing and wonderfully creative. Thank you for always providing great inspiration. Wow, these look so totally fabulous!! Incredible patience, and I love these awesome colours! 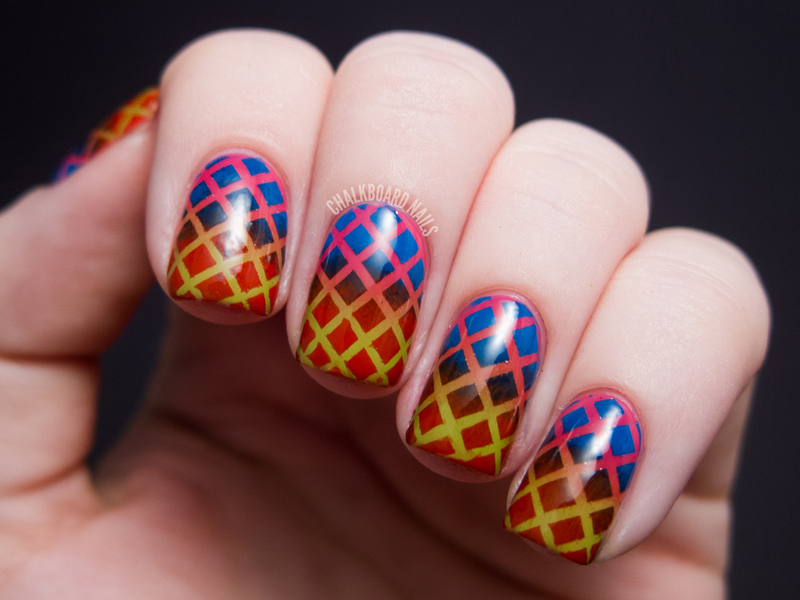 Oooh gorgeous gradient nails, double the lovliness! Wow...that is amazing. I might attempt it for an accent nail but can't imagine doing my whole hand! That takes some patience! This is ridiculously amazing.. RIDICULOUSLY!!!!! This is beautiful! I'll try this out!!! This is such a cool manicure! I love this! It is such a bold look, and seems like it is a lot more simple to achieve than it looks, despite being fiddly and time consuming, the concept seems quite simple. I definitely intend to buy some striping tape if looks like this can be achieved with it! :) love it. This is so beautiful, words cannot describe! Wow, this idea is so beautiful! There is so much going on, in a good way! Great work, Sarah! This is amazing! Wow, this is a masterpiece & it definitely looks like it took quite a while to perfect. It came out wonderful! I love it! Oh, You always manage to surprise me! Even when I think "ok, now, this is the best nail art ever, and cannot be beaten in anyway" then you come up with a new idea and it is always greater! In my comment I'm sending loads and loads of admiration! I love it! I will try by myself it and let you know the result. Nice job!! I love how this is bursting with color! I'm glad to hear that you enjoying wearing it for a good amount of time. Well done! Sorry if this is a dumb question, but do you pull off the striping tape when the top layer(s) of polish is all dry, tacky, or still wet? You always want to remove the tape when the polish is wet. I try to let it dry for a few extra seconds before removing to keep the polish from running or dripping anywhere, but definitely while it is still wet. I have no words.... You are incredibly talented! WOW!! this is incredible!! Bravo! I would absolutely attempt this as an accent nail. What a great idea!! These just scream circus to me. It is obvious you are fiddely with the striping tape - those lines are perfect! Plus a double gradient? You rock girl! The mixture of green, pink and blue are awesome and bright. 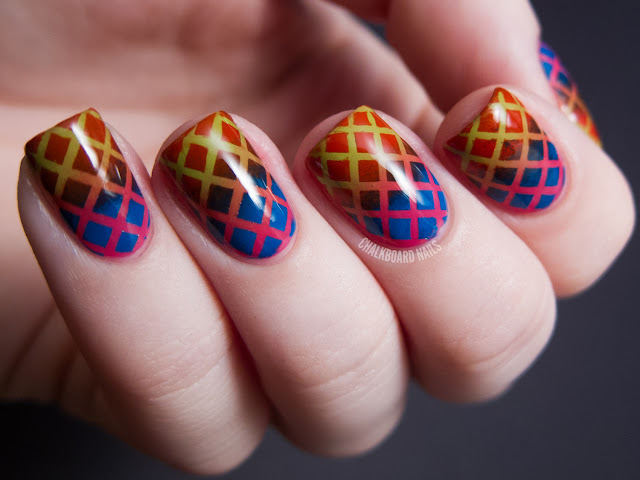 It needs a great effort to do this nail art. I would appreciate if you can give us the steps to do it. 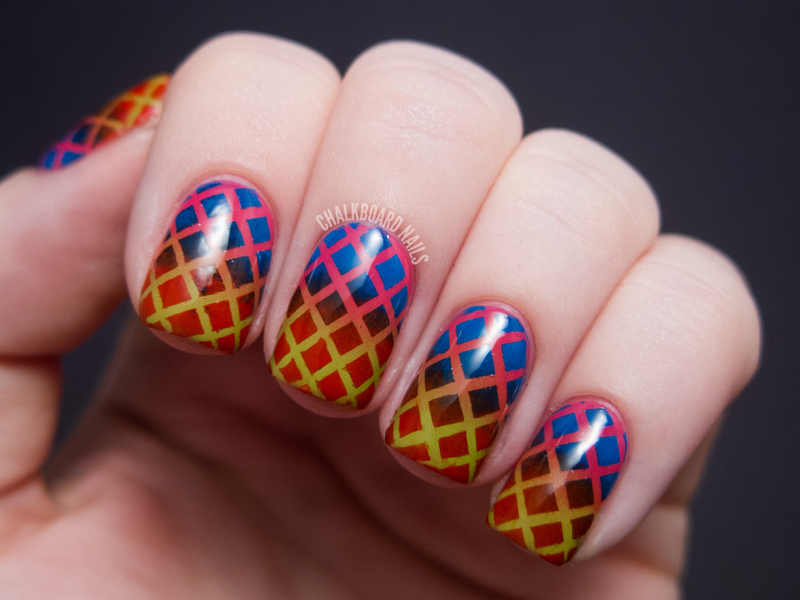 this is an awesome mani!!! I know u have written how u did it..but if poss pls do a pic tutorial!! Wowza! I have a feeling that I would get to the last strip of tape and mess it up. Then I would have to cry. This is so very epic! I have seen nothing like this ever! A gradient over a gradient is so brilliant! Love it! so beautiful and perfectly made! good job! Yay you did a great job. I love it! wow - i don't know how i missed this but you certainly excelled yourself here!!! love the colors...turned out beautiful!